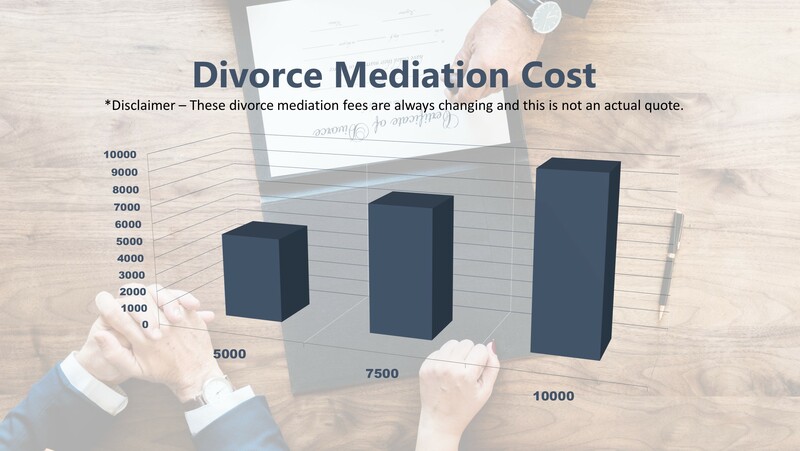 On average, divorce mediation costs anywhere from $5,000 to $10,000 per spouse for the US in 2019, according to Equitable Mediation. Furthermore, according to Thumbtack, you can expect to pay anywhere from $300 to $700 an hour to hire a private mediator. When two parties negotiate a divorce agreement out-of-court it goes through a process known as divorce mediation. This is done with the help of a third-party neutral known as a mediator. This individual is neutral, meaning they do not favor either spouse. The mediator does not have the power to make divorce decisions and is not a judge. The mediator is typically a family law attorney, or former family law judge or other professional well nuanced in the law. The cost can vary greatly dependent on the divorce mediation type. Most sessions are billed by the session or the hour. Usually, a divorce mediation session will take around two to fours hours to complete. Some cases require multiple sessions, some cases can be resolved on the first mediation day. What Are The Factors That Determine Divorce Mediation Cost? Four factors assist in determining the cost of mediation for divorce. The Fee For Set-Up. Many mediators will charge an initial set-up fee for meeting with the spouses. At the first meeting, the couple and the mediator will go over the various issues that will need resolving. The Amount Of Mediation Sessions. Clearly, the number of sessions you have will determine the total you will have to pay. The more sessions required to hammer out a deal, the higher the expenses will trend. Community-based Divorce Mediation. Offered through an agency, a community-based divorced mediation will provide a mediating service for free or at a reduced cost for those without sufficient means. Private Mediation: Often costing between $200-$750 per hour, a private practice divorce mediator. You can expect to pay an average of $200-$400 per hour. Depending on your location and the years of experience the divorce mediator has, the cost can vary greatly. You usually get what you pay for, however. Are There Any Other Costs Associated with Mediation? There are other charges associated with divorce mediation. If the couple succeeds, there will be charges for the creation of the final legal documents. This can vary from $500 to $2,000, ideally this expense can be equally shared. Filing a request for mediation. Maintaining a written record of the mediation sessions. Should I Consult a Lawyer about Divorce Mediation Cost? If you are considering a divorce or in the process of getting a divorce, please contact a divorce attorney. You still need the advice and assistance of a lawyer so they can overlook the process and protect rights that belong to you. Remember, divorce mediation is very helpful when it comes to settling issues that are out of court. In larger asset families, both parties usually attend live mediation with their lawyers in tow. Others with less resources to spend may want their lawyers “on call” by cell phone as they work their way through the mediation individually with the mediator and spouse. How Much Does Divorce Mediation Cost In Arizona? The average divorce mediation cost in Arizona is about $7,500. Arizona divorce meditation costs ranged from $5,000 to $10,000 in 2018-2019. Hiring a private divorce mediator in Arizona will cost you an average of $500 per hour; with hourly costs ranging from $300 to $700. Speak with Our Scottsdale Divorce Mediators Today! We have a network of Arizona attorneys, tax specialists, estate planners, financial planners, child specialists, real property appraisers, adult and child therapists and parenting coordinators who are here for you if you ever need them. Our Scottsdale divorce mediators are here to make your divorce less stressful and keep you in control. Learn more about divorce mediation costs on YouTube.